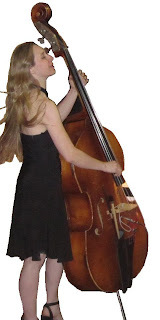 Genevieve Rose is an acoustic and electric bassist who has performed nationally for over 20 years with various jazz, big band, vocal, dixieland, and latin ensembles. She also teaches instrumental music at Orchard Hill School in South Windsor, CT, directs the jazz ensemble at Smith College in Northampton, MA, and has been a faculty member of University of Massachusetts Amherst’s Jazz in July Summer Music Programs since 1997. EUGENE UMAN TRIO @ The Lounge, 4 High St. Brattleboro, VT 7-10pm. For more information, contact info@duorestaurants.com or call (802) 254-4141. Free. Amanda Carr and Friends At Chanti in Beverly, MA: Where Can I Go Without You? Dan Salazar Ensemble at Guitar Under The Stars 2010 "Overture"
J-Street in Newport, RI 7/25/10 "Exactly Like You"
Guitar Under The Stars 2008. Beantown Swing Orchetra "Just a Gigolo"
Beantown Swing Orchestra"New York, New York"
Beantown Swing Orchestra "It Had To Be You"
Beantown Swing Orchestra "The Way You Look Tonight"
Beantown Swing Orchestra "Jump Jive and Wail"
Beantown Swing Orchestra "Boogie Woogie Bugle Boy"
Beantown Swing Orchestra "The Trolley Song"
Celia Sings Sinatra "The Best is Yet to Come"
Celia Sings Sinatra "Angel Eyes"
Celia Sings Sinatra "I've Got You Under My Skin"